Today I picked up Katie at the Ithaca bus depot, and she had a birthday present for me! And what a present! 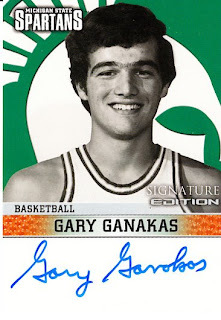 She'd never heard of my fixation on Michigan State basketball great Gary Ganakas until I posted about it, but look what she found on eBay!! ScienceDaily (2008-12-15) -- Researchers in Nevada are reporting that waste coffee grounds can provide a cheap, abundant, and environmentally friendly source of biodiesel fuel for powering automobiles and industries. ...and wonder how the story would play on Facebook, you have to read this. ...one of my life-long heroes writes a comment on my blog! I could die a happy woman! I mean, it would be cool to hear from Stephen Colbert or Jon Stewart, but GARY GANAKAS! Oh my gosh! When I started blogging in 2005, I had no clue what a blog was--I'd been hired by an optics company that, since it's now been sold to a megacorporation that sells too much crap, I won't mention by name. Anyway, while it was a local company and while I had absolute freedom to write whatever I thought was important, and while I was doing interesting birding things, it was fun and rewarding to put together a blog that was worth reading. This week I finished a book manuscript and am now busy with other projects, and am so swamped that 2008 is apparently going to be the first year since 1985 (the year I had two toddlers and was pregnant, and then delivered, my third baby) that I didn't see a single lifer. As a matter of fact, thanks to lumping the Mangrove Black-Hawk, my lifelist is actually SHORTER now than when the year started. So even though I'm having a great time and feeling a little like I'm accomplishing things, I'm treading water with my radio program and don't feel like I have much left to say on a blog--especially when there are so many fabulous ones out there now. I'm doing one fun project, Twin Beaks, trying to keep up with my radio program and iTunes podcasts and otherwise am ready to call it a day with blogging until I have something new to report. Meanwhile, please keep 101 Ways to Help Birds in mind. So far no one has found a single issue that affects wild birds that I haven't touched on in that book. Even the big issue about oil tailing ponds right now was discussed in my section on why it's so critical for every one of us to conserve energy. Sadly (for me, at least), the main way people are conserving energy right now is in not buying my book. So when you want a chuckle, check out Twin Beaks, when you want to buckle down and do something to help birds, read my book (even if you don't buy it, you'd be surprised how much you can read via Google Books), and have fun and joy with birds, and do what you can to ensure they stay on the planet as long as possible.